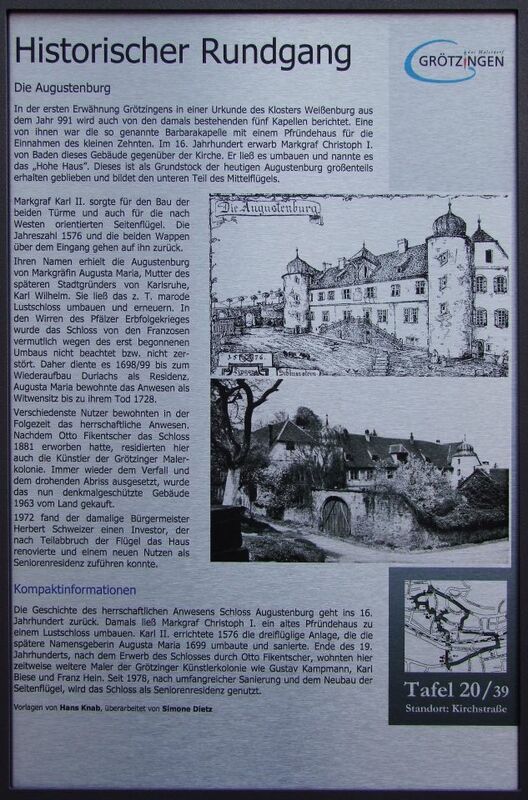 In the first mention in a document of the monastery Grötzingens white castle from the year 991 is also reported by the then existing five chapels. One of them was the so-called Barbara chapel with a benefice house for the income of the small tithes. In the 16th century Margrave Christoph I of Baden bought the building opposite the church. He had it rebuilt and called it the "House". This has remained largely as a basis of today's Augustenburg and forms the lower part of the center wing. Margrave Karl II caused. For the construction of the two towers and also for the oriented to the west wing. The year 1576 and the two coat of arms above the entrance back to him. Different users inhabited in the period following the grand estate. After Otto Fikentscher had purchased the castle in 1881, resided here, the artists of Grötzinger art colony. Again and again exposed the decay and the threat of demolition, the now landmarked building was purchased in 1963 by the country. 1972 was the then Mayor Herbert Schweizer an investor, who renovated the house after partial demolition of the wing and could perform a new benefit as a retirement home.